Yosemite Valley is at the center of most visitor activity in Yosemite National Park. 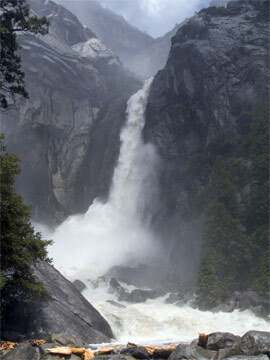 The Merced River flows across the Valley's flat floor at an elevation (altitude) of 4,000 feet (1220m) above sea level. The Valley floor includes oak and mixed-conifer woodlands and numerous meadows, inhabited by diverse wildlife. 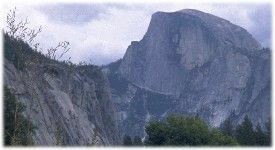 The Valley is surrounded by steep, almost vertical, granite cliffs, including the El Capitan monolith, Glacier Point, and Half Dome. Major waterfalls tumble into the Valley, the most prominent of which are Yosemite, Bridalveil, and, less easily seen from below, Vernal, Nevada, and Illilouette. The falls reach their maximum flow in late spring and drop significantly in flow as the season progresses. Extensive visitor activities, facilities, and services are available in Yosemite Valley, mostly in Yosemite Village near the Valley's east end. In the Village you can visit the Valley Visitor Center and see its orientation film, publications, theater programs, and exhibits highlighting Yosemite Valley's natural and human history. Self-guiding trails are nearby. Elsewhere in Yosemite Valley, you can gaze up at the waterfalls, visit Mirror Lake/Meadow in the East Valley and the famous "Tunnel View" of Yosemite Valley at Wawona Tunnel above the West Valley, watch rock climbers on El Capitan, take in the exhibits at Happy Isles Nature Center, and explore the Valley on your own on foot or by bicycle on miles of trails. For complete details see the Yosemite Guide and Yosemite: Your Complete Guide to the Park. The National Park Service has maps of Yosemite National Park and Yosemite Valley on its Web site. The Yosemite Conservancy has two Webcams operating in Yosemite Valley and looking in the direction of Half Dome: one at Ahwahnee Meadow and one at Turtleback Dome. It is currently Wednesday at 7:39 am in Yosemite National Park. The WebCams do not produce images at night. Note: To reduce traffic in Yosemite Valley, you will find it convenient and pleasant to park your car and walk or bicycle to the places you want to see or ride the free shuttle buses that serve the Valley's east end. If visiting for the day, park in the day-use parking lot near Yosemite Village. Yosemite Valley is open all year. You can reach it from the south via State Route 41 from Fresno, from the west via State Route 140 from Merced through the Arch Rock entrance, and from the west via State Route 120 from Modesto, Manteca, and the San Francisco Bay Area through the Big Oak Flat entrance. In late spring through mid-autumn, snow permitting, it can also be reached from the east on the Tioga Road, State Route 120, from Lee Vining. You must carry snow chains for your vehicle in season. See Lodging within Yosemite National Park for details and reservations. Nearby lodging is also available outside Yosemite National Park's borders (and on some private property within the borders). See Camping in Yosemite Valley for details and reservations. Nearby camping is also available elsewhere within Yosemite National Park and outside the park.